babybuds® is online baby giftopia, selling innovative gifts for babies, new mums, siblings and dads throughout Australia and New Zealand. 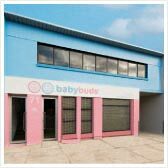 Established in 2002, babybuds started as a home business and has grown to a business with 20 staff and a New Zealand licensee. The novel idea for babybuds developed when creator Charmaine Papallo gave birth to her daughter Olivia in 2001 and was inundated with gifts of fresh flowers and designer baby clothes from family and friends. 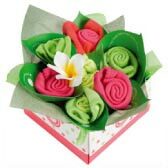 This experience planted the seed for the innovative baby clothing bouquets that are the secret behind babybuds success. I am most proud of having built a profitable business whilst providing flexible work conditions that support mothers. babybuds continually supports women and their choices regarding whether to return to work. babybuds employs all sorts of women, from women who have been full time stay at home mums for 10 years and are just returning to the workforce to those who wish to return to full time work. babybuds provides work from home options, school l hour positions, part-time and full-time options and combinations of these options. My business philosophy is to always challenge what we do to do it better. I work very hard to filter this philosophy to staff, via our monthly staff newsletter, staff competitions and staff functions. Staff are rewarded for innovating and improving, it is part of our culture and the way staff conduct. We've been expanding to ensure we have beautiful gifts to suit all budgets. Our range now includes: bouquets, toys, sibling products, luxury services, books and pregnancy gifts. We've also created some delightful special baby occasions gifts perfect for christenings, baby's 1st birthday, Fathers Day, Mothers Day, baby's 1st Xmas & Easter. babybuds® strives to ensure that customers and those who receive babybuds products get a "wow" feeling when they see and receive our products. We aim not to deliver great service but legendary service to all of our customers. babybuds® will not be satisfied with providing anything less than this. In 2007 babybuds introduced a Buddy Rewards Club. By becoming a buddy our regular customers can enjoy many benefits, such as discounts, special offers and upgrades. Becoming a babybuds buddy is easy, simply register online and our monthly specials will be emailed to you each month. Our e-newsletters are sent monthly and includes great updates on new products and services as well as special offers and discounts. babybuds is excited to be keeping our customers updated with competitions, latest products, events, special offers and what's happening in our business via the social media networks. Customers and followers of our business can Become our Fan on Facebook, Follow us on Twitter or read about our latest news and industry news on our blogspot. We also value your feedback regarding new products and how we can improve. So feel free to keep in touch.